Ven. 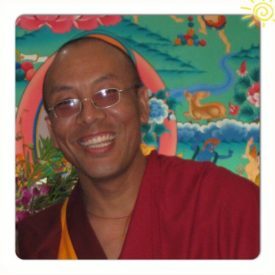 Thubten Rigdol is the current resident teacher of Ganden Yiga Chozin Center. Ven. Thubten Rigdol (Ang Losang) was born in 1971 in Lukla, near Mount Everest. In 1980, at the age of nine, he was ordained as a monk at Kopan Monastery. After serving as translator and teacher in Losang Drakpa Buddhist Center in Malaysia, he was appointed headmaster of the Kopan Monastery School and served in this capacity for three years. Ven. Thubten Rigdol has extensive teaching experience, teaching in Dharma centers in many different countries. Thubten Rigdol was appointed director of the Ganden Yiga Buddhist Meditation center by Khenrinpoche Geshe Chonyi.